There are a lot of publication pages on GOV.UK: over 40,000 at the last count. They look simple, but it can be tricky to get them right. 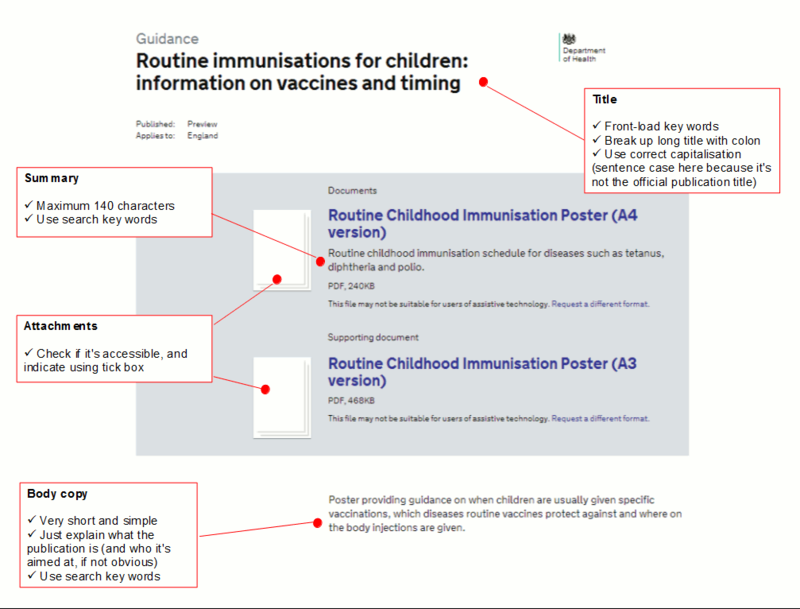 The Department of Health (DH) digital team has produced guidance on how to edit and produce publication pages. Our previous approach to publication pages was quite different to GOV.UK – they were usually written in a newsy style, and relied more on WordPress tags and categories than SEO. We needed a quick and easy guide to help us get out of deeply ingrained habits and adapt swiftly to the GOV.UK style. We also needed something that was suitable for both experienced and new web editors. This guidance has been - and continues to be - really useful for us. We’re publishing the DH guidance below, slightly edited so that it can be used by all departments. Publication pages should be really short and straightforward. They exist for one simple purpose: to help the user find the publication that matches their needs as quickly as possible. GOV.UK users often know exactly which publication they’re looking for, and search for it by name. So while the page title doesn’t have to be exactly the same as the official publication title, it shouldn’t be so different that these users can’t recognise it. Also, government often has lots of publications on a single theme. So titles should be specific enough to let users pick out the publication they're looking for from a long list of similar search results. The summary should clarify - very briefly - what the document is, for anyone who’s not sure from the title (bear in mind that the summary is the part of the page that’s usually shown in search engine results, underneath the page title). Try to include search keywords that aren’t already used in the title. No more than 140 characters. Don't start with 'This document...' or 'This publication...' - save space with something like 'Proposals on' or 'Guidance for...'. End with a full stop. The body copy should clarify - in slightly longer form - what the document is, for anyone who’s still not sure from the title and summary. Usually it's best to use the official name of the publication. But sometimes it makes sense to shorten it to aid scanning, especially if it's in a long list of attachments. In the example below we’re publishing two attachments on the same page; a white paper (the lead document) and the associated impact assessment (a supporting document). Here 'Equity and Excellence: impact assessment' works better as an attachment title than 'Equity and Excellence: Liberating the NHS – impact assessment'. The latter is too long. Tick the box if the attachment you're uploading is an accessible PDF. It's important for people using assistive technology like screen readers, and stops the 'Request a different format' email address appearing. If you have a copy of Acrobat Pro, run a full accessibility check. See the Government Service Design Manual for more about creating accessible PDFs. Don't upload responses to consultations as a publication: these should be added as attachments to the original consultation page. You can associate the publication with one or more policies. But you don't have to use it: only do so if the publication relates to something covered on the policy page. Almost always the department who is publishing the publication. This is the email address that people use to request versions in braille, large print format etc. Choose your department from the options listed. The email address only appears if you don't tick the box saying 'Attachment is accessible'. If the publication is part of a recognised document collection – eg 'DH spending over £25,000' – select the collection here. Other departments have similar document collections, so make sure you select the correct one for your department. Don't create ad hoc publication collections – it’s a good idea to have someone in your digital team to co-ordinate all of your department’s publication collections. If the publication applies to England only, tick the boxes for Scotland, Wales and Northern Ireland. Only tick this if there's a reason to stop people from other government departments viewing it prior to publication (eg because it's market-sensitive data). Use this option to set a future publication date. Bear in mind that you still need to get it second-eyed (or force schedule it under special circumstances) – otherwise it will just stay in 'submitted' state and not go live. Hello, I am not sure that the advice above is the same as in the style guide? The style guide says: The body of a publication page is used to provide a summary of the publication in plain, neutral language – to reassure the user that it is (or isn’t) what they’re looking for. Include what the publication is about and its purpose. But DH say above: don't summarise what the document says (you’re just repeating what’s in the document). This seems to be conflicting information. Could editorial please clarify, or perhaps supply more examples? The purpose of the body copy is help the user work out whether they've found what they are looking for. So it should be a brief description of what the publication is, including SEO keywords. And it should say who the publication is aimed at, if it's not obvious. I think that's what we were trying to get across in the style guide - but I agree that the language could be clearer. We'll look at changing it when we make the next revision to the style guide. Hope that helps to clarify things. This is a really useful article - very helpful for those of us moving over to GOV.UK. Is there one for detailed guides? Would be really useful if there was a blog like this for each of the content types. The GOV.UK style guide has guidance on how to use each of the content types, including detailed guides: https://www.gov.uk/design-principles/style-guide (in the section called 'Content types'). You'll see that we used this blog post as the basis for some of it.